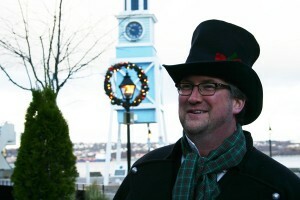 John Lindsay-Botten, founder and director of The East Coast Carolling Co., has been putting together professional carolling quartets for over eight years, bringing the sounds of Christmas and other holidays repeatedly to places like Spring Garden Road, Dartmouth Crossing, Downtown Dartmouth, Halifax’ Holiday Parade of Lights, Sunnyside Mall in Bedford, and at The Halifax Club. This doesn’t even mention single-performance engagements for companies such as Scotian Homes in Enfield, Intact Insurance, Farnell Packaging, the Nova Scotia Department of Health, and Mac Interior Designs, just to name a few. While singing at a number of weddings and Valentine-themed performances, and other occasions, the Christmas season is their busiest time of the year, bar none…but that doesn’t mean they’re too busy to include your special engagements. John is also busy as a private music instructor, Minister of Music and Dramatic Arts at Knox United Church in Lower Sackville, singer/songwriter/arranger and professional vocalist and actor who has provided his voice-over talents for several commercials in the past (Baxter, Bell Aliant, Bluewave Energy, Communications Nova Scotia, Tourism Industry Association Nova Scotia, etc. ), appeared in short stints on Trailer Park Boys and Mr. D, and has sung in numerous organizations such as Opera Nova Scotia, the Capital Health Players, The Festival Singers of Halifax, the Chapel Choir at University King’s College, Cantabile Singers, the Walter Kemp Singers, Halifax Camerata Singers and others. In June of 2010, he played the lead, Pierre Trudeau, in a new Canadian Jazz Opera entitled Trudeau: Long March, Shining Path with Vocalypse Productions. Whatever musical or performance desires the clients have, John has connections, and will be happy and able to assist through The East Coast Carolling Company.